« Illegal immigrants: Treat them humanely or make their lives miserable? Screaming Frog Productions has produced a gem of a movie that helped me to think about the issue of immigrants—legal and illegal—who congregate to seek work as day laborers. It was directed by Jonathan Browning and has been shown at over 150 film festivals all around the world and won over 30 awards. 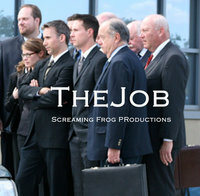 Watch The Job, a three-minute movie that changed the way I think of day laborers. And made me laugh heartily. Hillel was expressing the Golden Rule, which is at the center of ethical behavior in Judaism, Christianity, Islam, Hinduism, Shintoism, in fact in every religion we know of, dating from the earliest recorded history. It’s hard enough to practice the Golden Rule when your “neighbor” is literally your neighbor, but it gets progressively harder as the “neighbor” becomes more removed from one’s experience. The Job made it easier for me. This entry was posted on April 18, 2010 at 10:53 pm and is filed under Ethics-general, International, Politics, Tolerance. You can follow any responses to this entry through the RSS 2.0 feed. You can leave a response, or trackback from your own site. Anyone who’s willing to walk from Guatemala, swim the Rio Grande, and seek work in America is JUST the sort of person we need in this country. Willing to work, seeking the American dream — let ’em in and put ’em to work! Their kids will be our best new doctors and lawyers. My heart is with your comments, Bob, but there IS this thing about they broke our laws by entering illegally. The best solution would be to make our border practice consistent with our law–i.e., tougher border enforcement or loosen the law–and to treat people decently who are here. Who, as you say, are just the kind of people who built this country. Thanks for pointing us to this excellent short movie. EB, interested to get your thoughts on a problem that I see with the golden rule ( “do unto others as you would have done unto you.”) Namely that in human psychology there is a strong degree of self-abusive behavior (the identification with the abusive parent, turned against oneself long after childhood). The fact is, people don’t treat themselves very well at all, and actively destroy their happiness in ways large and small. To me, this renders the golden rule quite flawed, what do you think. Ah, flawed as it may be, over millennia it has proven to be the best we have. The best anyone can do is treat people as fellow humans.